Soccer ranks as a high-risk activity when injury is concerned (Lambson, Barnhill & Higgins, 1996). Each season more and more new boot designs appear yet the number of knee, lower leg, and foot injuries continue unabated. Epidemiological studies indicate adult males are likely to suffer one injury per 167 hours of play; female soccer players are at higher risk with approximately one injury per 147 hours of play (Nilsson, Roaas, 1978; Schmidt-Olsen et al 1985; Sullivan et al 1980). Most injuries are traumatic but there is a high incidence of overuse injuries also reported (6:4 ratio). Traumatic injuries arise during games more than practice and the risk of injury increases with the playing season. Early injuries tend to prevent the player from regaining and maintaining fitness although position and age has little bearing on occurrence and severity of injury. (Morgan & Oberlander, 2001). The trend for females to suffer moderate injuries is one hundred percent higher than males. Major injuries for both remain the same i.e. between 13 & 14%. (Morgan & Oberlander 2001; Soderman, Adolphson, Lorentzon, & Alfredson 2001). Between 68%-88% of all soccer injuries involve the lower limb (Albert, 1983; Ekstrand, Gillquist, 1983; Engstrom, Johansson, & Tornkvist, 1991; Fried, Lloyd, 1992; Nilsson, Roaas, 1978;Schmidt-Olsen et al, 1985;Schmidt-Olsen et al 1991). The knee and ankle are the most likely to be injured. (Brynhildsen, Ekstrand, & Jeppsson, 1990; Ekstrand, Gillquist, 1983; Engstrom, Johansson, & Tornkvist, 1991; Fried, Lloyd, 1992; McCarroll, Meaney, Sieber, 1984; Schmidt-Olsen et al 1991). Thought to be the most common occupational injury associated with soccer and reported by as many as 60% of soccer players is Anterior Ankle Impingement Syndrome (or Footballer's Ankle). 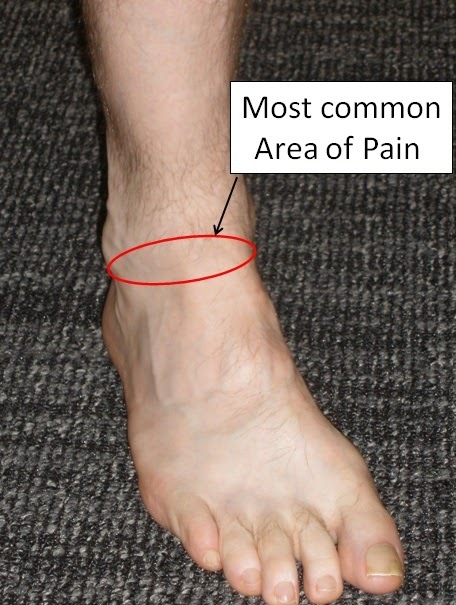 The condition is caused by either; thickening of the tendon and joint capsule caused by stretching with the downward movement of the foot when the ball is kicked; or alternatively, osteophytic damage (bone) to the ankle joint caused by contact with the ball (Tol, Slim, van Soest, & van Dijk, 2002). 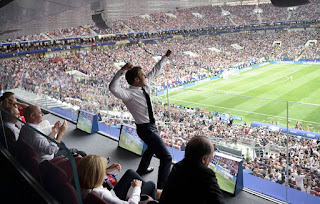 Kicking is the most widely studied soccer skill (maximum velocity instep kick on a stationary ball) and it would appear modern soccer boots provide poor protection to the foot and ankle from a career in kicking the ball. 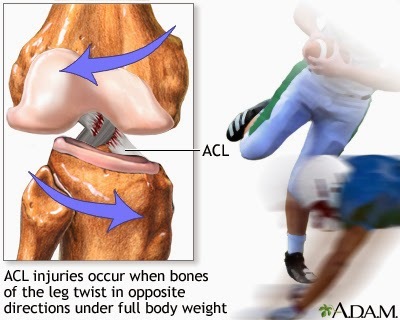 The incidence and severity of knee injuries has also been significant among football players. The common factor in Anterior Cruciate Ligament (ACL) injuries is foot fixation, which has been described as leading cause of ankle injuries in sport (D'Ambrosia, 1985; Torg, 1982; Torq, Stilwell, & Rogers, 1996) . The exact incidence of injury attributable to footwear in soccer remains unknown. Association between cleat design and injury rate is however reported within the literature (D’ Ambrosia, 1985; Torq JS Quedenfeld, & Landau,1974). Several specific mechanisms of injury have been described that produce ACL tears and many of these do not involve contact with another player. Instead problems appear to occur from torsional forces transmitted to the knee when the player makes a sudden directional change with a planted foot while decelerating. In the event of physical contact provided the foot can be released from the ground then injury to the ACL can be reduced. It is generally accepted high frictional forces between the foot and the playing surface result in fixation and this fixation is a least partially responsible for knee ligament injuries. 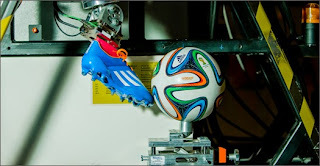 Traditional soccer boots provide traction with the ground, which is critical to a player’s performance, however it is now thought this shoe to surface traction may also contribute to injury. With no traction the player finds difficulty in maintaining balance when turning and twisting or running on wet surfaces. 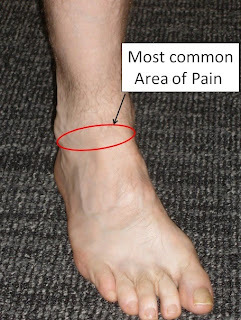 Too much traction permits twisting forces to move proximal on joints above the foot. Application of forces stressing the knee in a plane other than the normal joint motion results in injury if the force exceeds the elastic capabilities of any of the structures being stressed (Torg, Stilwell, & Rogers, 1996). The axial rotation at the playing surface appears to be affected by the magnitude and nature of impact. By the seventies researchers had discovered an association between cleat design and injury. Higher injuries were recorded in conventional shoes with a traditional seven-cleat pattern. The length of the cleats were " 3/4"" long; and "3/8 " in diameter.It was also found the composition of the cleat was a contributory factor. Researchers identified different patterns of injuries between shoe sizes and concluded the smaller distances between the position of studs, across the ball of the foot, might account for a higher magnitude of rotation. As a result of these finding the changes to the games rules have resulted and size restrictions and other restrictions on cleats. According to Levy, Skovron, & Agel (1990) any increase in fixation to the ground increases the risk of injury. Ekstrand & Nigg speculated as much as 60% of all non-contact soccer injuries may be due to excessive shoe surface tension. The conclusion of Bonstingi, Morehouse, & Niehel (1975) was torque developed between playing shoe and surface as a result of a force applied to the leg and an athlete depended on the type and design of the shoe¹s outer sole, the playing surface, the player weight supported, and the foot stance. The reduction of rotational force is thought by many to reduce the rate of injury to the knee. Tests on artificial turf indicate the more pliable the cleat the greater the release coefficient, although this alters with changes in surface temperature. The authors concluded release coefficients both within and among shoe models across a range of turf temperatures. Ironically on artificial turf the researchers found flat-soled basketball shoes performed better than cleated soccer boots did. 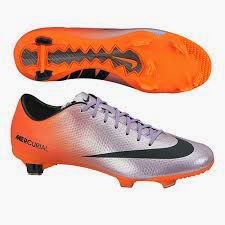 Of particular concern was the introduction of a design that included round spike cleats on the interior portion of the sole with irregular cleats on the outer rim. Although this design enhanced traction, it was reported when worn by athletes it was also associated with a high incidence of serious knee injuries (Majid & Bader 1993). A spate of high profile players were reported to suffer stress fractures at the same time lightweight boots were being introduced. Many sports scientists alarmed at the potential risk to players issued health warnings. March fractures of the metatarsal bones are usually fatique fractures caused by over use and not by one off trauma due to serendipidous trauma . High profile players reported with stress fractures of the metatarsals were more likely to be over training and/or have a heavy playing schedule. Injuries in the amateur game continue to be related to inadequate preparation and players not warming up and warming down. 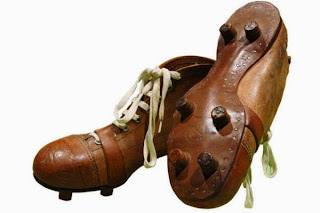 Genuine concerns were also expressed when the new generation of cleats were first introduced in particular when some players used them to rip and tear the flesh of opponents . Some players will risk injury to enhance performance, by chosing inadequate boots and cleat designs. Most amateurs remain oblivious to the risks and there have been calls from concerned consumers for manufacturers to indicate clearly on their labelling the types of playing surface conditions their shoes are meant for. (Heidt et al, 1996). Further, concerns have been expressed at deceptive claims found in marketing sport shoes, according to researchers at McGill University. False notions of protection may lead to a higher rate of injury and this could include claims for improved performance. The majority of career ending injuries involve the knee, ankles and hips with osteoarthrosis (OA) a serious complication. Approximately 2% of professional players are forced to quite the game due to acute injuries. Despite being low this is higher than many other occupations. However there are a larger number of players forced to quit due to chronic injuries sustained and maintained by playing soccer. Further, Drawer, Fuller, & Waddington (2002) recently reported many retired professional players have admitted to playing games whilst unfit or receiving pain killing treatments for existing injuries with the full knowledge of their employer. Osteoarthritis in at least one of the lower extremity joints is very high and significantly greater than in the general population. Health and Safety regulations in the UK now require employers to identify hazards and risks from their work activities and to provide appropriate information and training about the risks. Employers are specifically required to provide health surveillance to employees where significant risk to their health is identified. (Drawer, Fuller, & Waddington 2001). By this token employers are now responsible for players suffering from industrial related injury which prevents them from earning a living. Published studies clearly indicate the provision of injury prevention and socio-economic services at professional soccer clubs (UK) remains inadequate and there are now calls to develop a long term strategy for managing players forced to retire through injury. The UK Industrial Injuries Advisory Council (IIAC) has so far dismissed these claims and refused to accept OA of the knee due to soccer is a boni fidi industrial injury and has refused to include it in the Industrial Injuries Scheme under Contributions and Benefits Act (1992). The IIAC are currently considering OA of the hip. Albert M 1983 Descriptive three year data study of outdoor and indoor professional soccer injuries Athletic Training 18 218- 220. Bonstingi RW, Morehouse CA, Niehel BW 1975 Torques developed by different types of shoes on various playing surfaces Med Sci Sports 7 127-131. Brynhildsen J, Ekstrand J Jeppsson A 1990 Previous injuries and persisting symptoms in female soccer players Int Journal Spots Med 11 489-492. Bucher S. 2002 Unplublished thesis. Northampton: Nene College. D'Ambrosia RD 1985 Orthotic devices in running shoes Clinical Sports Medicine 4 611-618. Drawer S, Fuller CW, & Waddington I 2001 Propensity of osteoarthritis and lower limb joint pain in retired professional soccer players British Journal of Sports Medicine Dec 35:6 402-408. Drawer S, Fuller CW, & Waddington I 2002 Perceptions of retired professional soccer players about the provision of support services before and after retirement British Journal of Sports Medicine Feb 36:1 33-38. Ekstrand J, Gillquist J 1983 Soccer inuries and their mechanisms: A prospective study Med Sci Sports Exerc 15 267-270. Ekstrand J, Nigg B 1989 Surface related injuries in soccer Sports Medicine 8 56-62. Engstrom B Johansson C Tornkvist H 1991 Soccer injuries among elite female players Am J Sports Med 19 372-375. Fried T, Lloyd GJ 1992 An overview of common soccer injuries: Management and prevention Sports Med 74 269-275. Heidt RS et al 1996 Differences in friction and torsional resistance in athletic shoe turf surface interfaces Am Journal of Sports Medicine 24:6 834-842. Heidt RS, Sweeterman LS, Carlonas RL, Traub JA, X F 2000 Avoidance of soccer injuries with preseason conditioning American Journal of Sports Medicine 28:5 659-662. Lambson R Barnhill BS Higgins RW 1996 Football cleat design and its effects on anterior cruciate ligament injuries: A three year prospective study American Journal of Sports Medicine 24:2 155-157. Lees A & Nolan L 1998 The biomechanics of soccer : a review Journal of Sports Sciences 16:3 211-234. Levy IM, Skovron ML, Agel J 1990 Living with artificial grass: A knowledge update Part 1: Basic science American Journal Sports Med 18 406-412. Majid F & Bader DL 1993 A biomechanical analysis of the plantar surface of soccer shoes Proceedings Instn Mechanical Engineers 207:2 93-101. Masson M Hess H 1989 Typical soccer injuries: Their effects on the design of athletic shoe In Segesser B & Pforringer W (eds) The shoe in sport London: Wolf Publications 89-95. McCarroll JR, Meaney C, Sieber JM 1984 Profile of youth soccer injuries Physician Sportsmed 12:2 113-117. Morgan BE Oberlander MA 2001 An examination of injuries in major league soccer: The inagural season American Journal of Sports Medicine July/Aug 29: 4 426-430. Nilsson S, Roaas A 1978 Soccer injuries in adolescents Am Journal Sports 6 358-361. Schmidt-Olsen S et al 1985 Soccer injuries of youth British Journal of Sports Medicine 19 161-164. Schmidt-Olsen et al 1991 Injuries among young soccer players American Journal of Sports Medicine 19 273-275. Soderman K Adolphson J Lorentzon R Alfredson H 2001 Injuries in adolescent female players in European football: a prospective study over one outdoor soccer season Scandanavian Journal Medical Science Sports 11:5 299-304. Sullivan JA et al. 1980 Evaluation of injuries in youth soccer Am Journal Sports Med 8 325-327. Tol JL, Slim E, van Soest AJ, van Dijk N 2002 The relationship of the kicking action in soccer and anterior ankle impingement syndrome: A biomechanical analysis American Journal of Sports Medicine Jan /Feb 30:1 45-50. Torg JS 1982 Athletic footwear and orthotic appliances Clin Sports Med 157-175. Torg JS & Quedenfeld T Effect of shoe type and cleat length on incidence and severity of knee injuries among high school football players. The Research Quarterly 42:2 203-211. Torq JS, Quedenfeld TC, Landau BS 1974 The shoe surface interface and its relationship to football knee injuries J Sport Med 2 261-269. Torq JS Stilwell G, Rogers K 1996 The effect of ambient temperture on the shoe surface interface release coefficient American Journal of Sports Medicine 24:1 79-80.